Chetopa is located on the Neosho River in Southeast Kansas at the junction of U.S. 166 and U.S. 59 (400), just 40 miles west of Joplin, Missouri and 30 miles east of Coffeyville, Kansas. The recreation area of Grand Lake of the Cherokees lies just to the south. Recreational opportunities abound with the Neosho River offering fine fishing for catfish, bass, and the annual paddlefish season occurring in Mid-to-late March. In fact, Chetopa is the "Catfish Capital of Kansas" due to its excellent year-round fishing for catfish and by historically having the largest catches of catfish in the state. The city is also known for large paddle fish (known locally as spoonbill) below the low-river dam. Chetopa was named after the Osage Indian Chief Chetopah and literally means "Four Houses" in the dialect. 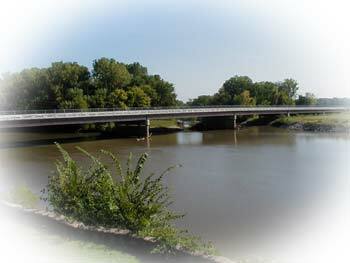 The area was first settled by Indians and early white settlers along the Neosho River in the early 1840s. In 1868, Dr. George Lyle established the Chetopa Town Company by purchasing the area west of Neosho River from the U.S. Land and Grant Office during President Grant's Administration. The first railroad to serve the area was the Missouri Kansas & Texas (MKT) Railroad in June 1870 and was instrumental in establishing the area as a community of white settlers. Chetopa has grown since it's early beginning into a prosperous town offering a variety of activities. The area offers recreational opportunities on and around the Neosho River, scenic areas, fresh pecans from the area's native pecan groves and a perfect place to relax. The area is famous for its productioin of Chetopa Native Pecans. Bountiful pecan groves offer fresh pecans which are sold in many of the area stores and at some of the groves themselves. The Chetopa pecans are nationally known for their unique flavor. The Chetopa Museum has many artifacts detailing the history of the town, and many historical homes dot the area with Colonel Cook's Home, built in 1875, a showpiece. Area accommodations include a motel and recreational vehicle pads in two of the City's parks. Several restaurants offer a mixture of good old fashion cooking and ethnic foods in between your antique shopping. Built in 1875, Colonel Cook's Home is a showpiece of historical and architectural spendor. It once housed the Bath Funeral Home. Elmore Park offers 28 public spaces with hookups, dump sites, and drinking water. Recreational opportunities abound with the Neosho River offering fine fishing for catfish, bass, and the annual paddlefish season occurring in Mid-to-late March. In fact, Chetopa is the "Catfish Capital of Kansas"